I slept very soundly in Henrico and woke up around 9am to eat breakfast before heading out. It was almost 11 when we finally left, but we only had 46 miles to go to get to Louisburg, so it was a relatively easy day. 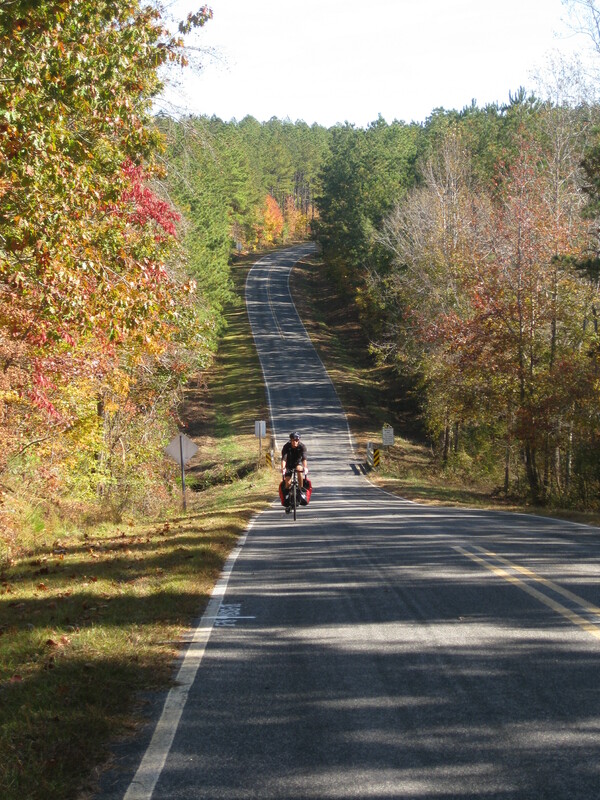 After Paul left, Phil and I packed up and rode about 4 miles down the road to visit Mary’s shop and say goodbye to her. It was a beautiful day, but the lack of a tailwind slowed us down considerably. I do wish that technology existed to record my thoughts directly into a word processing software somewhere in the cloud while I’m cycling, because I always have such elaborate thoughts that I tend to forget as soon as I get off the bike or something else distracts me. Today, what I remember from the ride was that I had the Canadian national anthem stuck in my head for a while, and then I struggled to recall the lyrics to my own American national anthem. Also, there were a good number of dogs out on the course today, and they all wanted to chase the bicyclists. I don’t even remember seeing a single dog during the whole trip so far, but today it seemed like every house we passed had at least one or two (or more) dogs that barked at and chased us. Most of them were fenced in, but there were a few that were not held back by any enclosure, and I got to use the water bottle technique on the ones that had any chance of catching up to me. At one point, there were so many dogs barking from so many different yards, it brought to mind the scene from 101 Dalmatians where all of the dogs are communicating with each other throughout the city and beyond. I’m pretty sure there is a strong line of communication between the dogs from Henrico to Louisburg. We stopped for a long break about 15 miles from Louisburg. There were no shops or restaurants anywhere on the route, so we laid our bikes on the ground on the side of the road, and sat in the sun eating snacks we had in our bags. Phil read for a while, and I inspected my bike to make sure everything was still running smoothly. We stayed there for about an hour, since we were ahead of schedule, and still we made it to Louisburg more than an hour before I had planned. Liz wasn’t going to be home for another two hours, so we found a cafe (the Coffee Hound Bookshop) that was conveniently located just two blocks from her house and waited there until about 6pm. Liz is one of my good friends from high school whose parents moved to Louisburg just after graduation, and I hadn’t seen her since she was visiting Rhode Island three years ago in 2008. We brought our stuff inside and ate dinner, and Phil read his book again while Liz and I phoned our friend Sam reminisced about old friends. 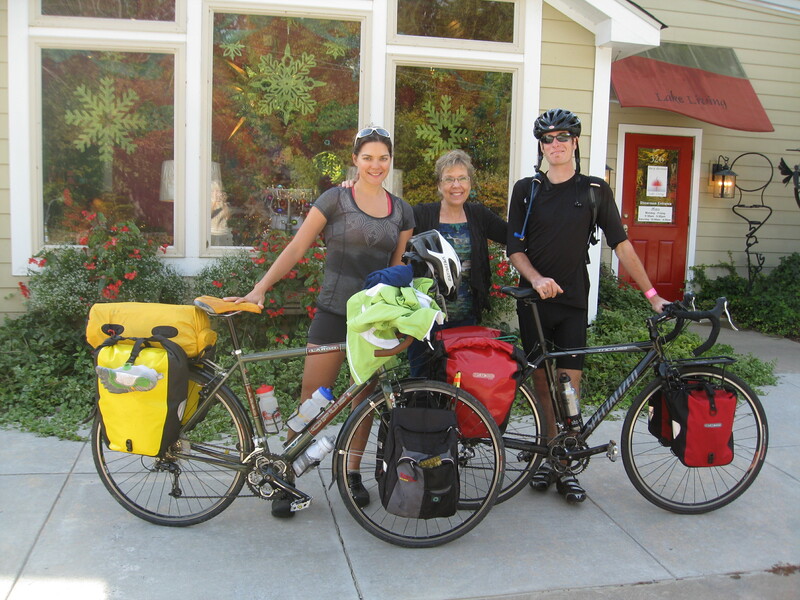 Posted on 4 November 2011, in Bicycle Touring, Providence to New Orleans. Bookmark the permalink. Leave a comment.